Friday, 28. 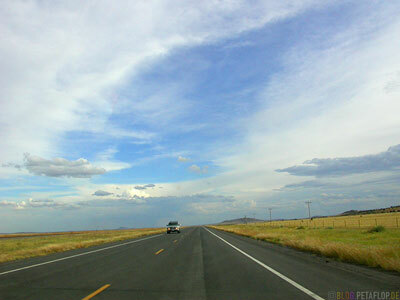 September 2007, Colorado and New Mexico, USA. 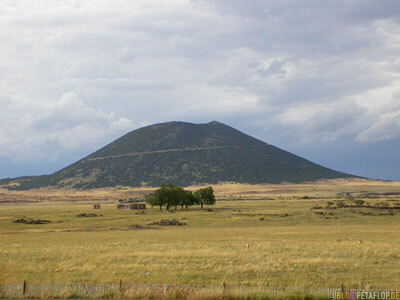 The volcano Capulin near the small town of Raton, New Mexico. The only elevation along Highway 87. Capulin, ein Vulkan und einzige Erhebung am Highway 87 in New Mexico, in der Nähe von Raton. Allen Motel close to the Texan border in Clayton, New Mexico. A hicktown in the middle of nowhere. No credit card machine worked in whole Clayton, they said a storm had destroyed a overhead telephone wire once again. It was very stormy here as it always is. 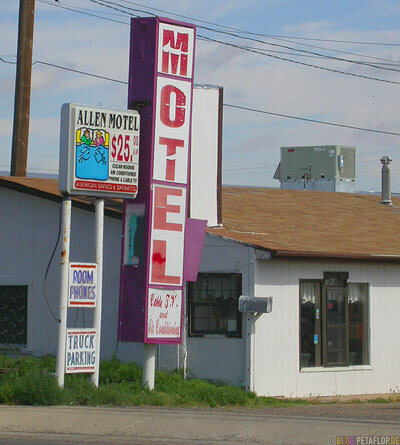 Allen Motel, kurz vor der texanischen Grenze in Clayton, New Mexico. Ein kleines Kaff in der Pampa. Im ganzen Örtchen funktionierte kein Kreditkartenlesegerät, ein Sturm hatte wohl mal wieder oberirdische Telefonleitungen beschädigt. Stürmisch war es die ganze Zeit hier und ist es auch sonst. We should have asked to see the room before checking in. This was the worst room we had yet. Everything was sticky except the bedding and we had some roommates: many carpet spots moved. The only good thing besides the low price of 30$ was the really big fridge. Sadly we had nothing to fill it. Wir hätten uns vor dem Einchecken das Zimmer zeigen lassen sollen. Das war bisher das mit Abstand schlimmste Motelzimmer. Bis auf die Bettwäsche klebte alles und wir hatten ein paar Mitbewohner: manche Teppichflecken wanderten. Das einzig Gute neben dem niedrigen Preis von 30$ für zwei war der riesige Kühlschrank. Leider hatten wir fast nichts, um ihn zu befüllen. 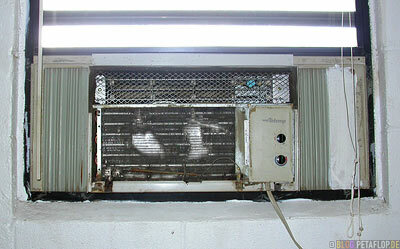 The air condition has definitely seen better days. Die Klimaanlage hat auch schon bessere Tage gesehen. seid ihr zurück? schade ;-) habe eueren reiosebericht sehr genossen, tolle bilder, schöne schreibe, perfekte strecke, sprich nix ausgelassen :) und ihr habt mir insb. alaska/canada schmackhaft gemacht. auch schön zu wissen, das noch andere “burner” in ddorf verweilen. ich fand burningman schon sehr beindruckend! I want to save you from that room!! Why not sleep in the car! Probably not a safe thing to do down there but .. oh my f**king god ..pictures always make things look less filthy than they really are …You are braver people than I realized!! Michael: Thank you, we survived and we never left a motel room that early in the morning. One of the many motels we saw had to be the worst. You get what you pay for. 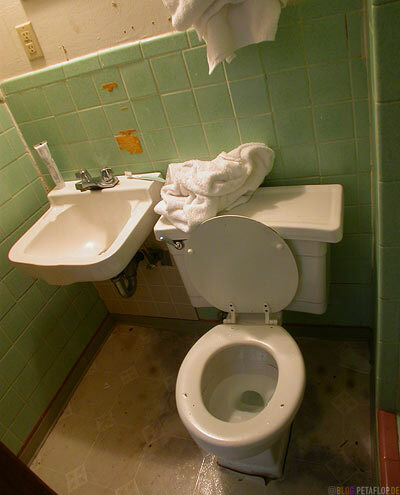 There are many other motels in that town… The Eklund Hotel is historical. Recently redone and very very nice. And in that town, you could have slept in your car. Crime is very low. During storms people open there doors to strangers in that town as well. But yes it is a small hick town in the middle of nowhere. ?? BLOG.PETAFLOP.DE ?? » Blog Archive » Day 93: Clayton great article thank you. Clayton was a nice place with wide roads and scenic beauty. No joke, that place was pretty gross. I hope you guys made it through the night okay and then moved on to bigger and better pastures. that looks creepy and dirty. was there a lot of people travelling and occupying motels like that? and how come all the scary and creepy movies loved the idea of a motel in the middle of nowhere?! =) or u like the true adventure? 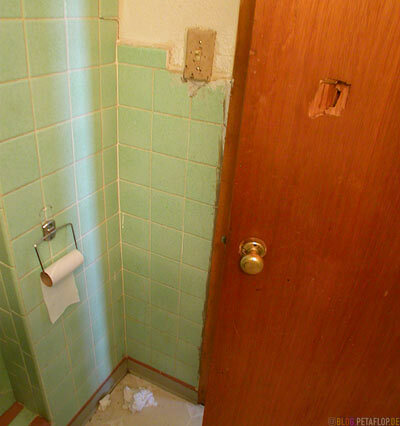 That is one ugly room. You should have look for a better one. Charge this on experience and do better next time. You have a nice experience with those stuffs. If it’s not usual for you to stay on a place like that, then at least you have tried. Dont worry, the place will not kill you. Just enjoy your stay and have fun..